With online information showing folks how home remodeling is done, it may inspire homeowners to consider doing a home improvement project themselves. YouTube videos and the edited HGTV shows by professionals can make it seem that doing a home remodeling project is easy, however, the Pro’s will tell you, often there is the unexpected challenge! Besides it may take a DIYer a lot longer to finish the project, and it may not look or be as well done as hiring someone with experience who does those projects for a living. 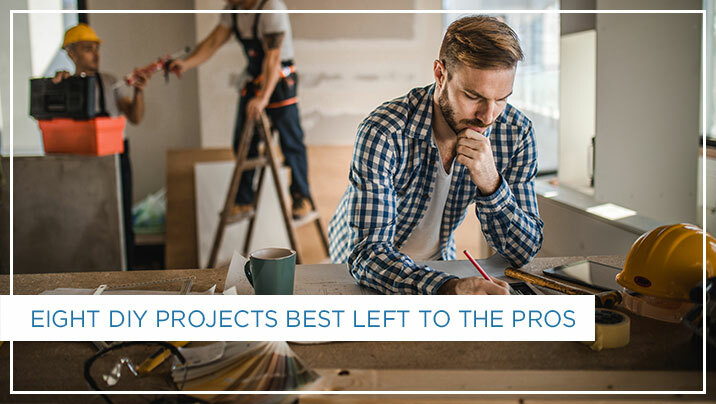 Here are 8 projects best left to professionals. Demolition– While it may look therapeutic to take a sledgehammer to a wall, one runs the risk of hitting wiring, ducting, gas, water or waste lines, or taking down a support wall. If your home was built before the early 1980’s, there could be lead in the paint or asbestos which requires specialists wearing HAZMAT suits and specific procedures to remove it and test the environment to make sure it is safe to occupy. Electrical– Limit electrical tasks to changing bulbs, anything else requires someone with a license who knows wiring and building codes. Improperly done wiring is dangerous and can be a fire hazard, even years later. Roof repairs– Insufficiently repaired roofs can cause slow leaks creating more damage and mold potential. Plumbing– Water leaks can be difficult to detect and diagnose. You may think you properly installed hardware, or a simple leak was fixed, but improper installation or repairs could lead to a line failure later. You do not want to come home to a flooded house! Gas line work– Not many would dare tackle dealing with a gas line. However, if you are going to do digging on your property, make sure to call the utility companies to mark where their lines are located. You could accidentally hit a gas line, and if there is a spark…. Insulation – Sprayed in or blown in insulation offers more energy efficiency which will help lower utility bills. Enclosing a patio – Any addition to a home, including enclosing a patio has building code regulations. We have been called in many times to bring a DIY patio enclosure to code so a homeowner could sell their house. Kitchen Remodeling or Bathroom Remodeling – These rooms have complex systems for water, waste, ventilation, electricity, and appliances. It is just best left to the pros. When in doubt, ask yourself these three questions: Could error damage you home? Does it require a permit? Could you be injured? (that includes not having the stamina and condition of working physically all day). These red flags should not be ignored, and are signs that it is project best left to a company with the proper licensing and expertise to handle the job. It is less expensive and less stressful to get it done right in a timely manner. For a child is born to us, a son is given to us; upon his shoulder dominion rests. They name him Wonder-Counselor, God-Hero, Father-Forever, Prince of Peace.